Saudi Arabian-led coalition resumes airstrikes against Houthi rebels, hours after the expiry of a humanitarian truce. 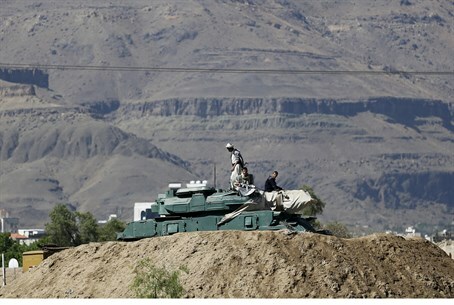 A Saudi Arabian-led coalition resumed airstrikes against Yemen's Houthi militia in Aden Sunday night, hours after the expiry of a humanitarian truce, Reuters reported. An eyewitness told the news agency explosions could be heard near the southern city's airport and the districts of Khor Maksar and Crater shortly the five-day ceasefire expired. No further details were immediately available. Late on Sunday a spokesman for the Yemenite army, much of which is allied to the Houthis, welcomed a request by the UN envoy to Yemen to extend the truce to allow more aid to be delivered to the war-damaged Arabian Peninsula country. "We welcome the call by the UN envoy to Yemen ... regarding the extension of the truce and the need to deliver humanitarian aid to citizens," Yemen's Houthi-controlled state news agency SABA quoted Brigadier General Sharaf Luqman as saying. Since Tuesday Saudi-led forces and Yemen's Houthi militias had largely observed a ceasefire meant to allow delivery of food, fuel and medical supplies to millions of Yemenis caught in the conflict since the alliance began air strikes on March 26. On Saturday, however, it was reported that fighting continued despite the ceasefire, with at least 10 people having been killed in the western city of Taiz. Relief groups say that the five days were hardly enough to allow sufficient supplies to reach the country of 25 million, according to Reuters. Saudi Arabia has said that extending the truce depended on how the Houthis and their ally, former President Ali Abdullah Saleh, complied with the ceasefire. The airstrikes are aimed at restoring exiled President Abd-Rabbu Mansour Hadi, who was forced to flee Yemen when the Houthis began marching on Aden. Iran backs the Houthi movement, and it is believed that the Islamic Republic is planning to use them to take over Yemen and seize the key strategic port of Aden, which controls the entrance to the Red Sea and ultimately to the Israeli resort city of Eilat.